Norwegian Prime Minister Erna Solberg was so taken with Pokemon Go that she was spotted playing the online game during a debate in her country's Parliament. 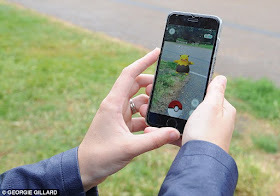 And it is not the first time Ms Solberg, 55, has been spotted trying to 'catch them all', after telling reporters she was trying to 'hatch eggs' during an official trip to Slovakia. Trine Skei Grande, 46, leader of the Liberals (Venstre), in Norway, and was spotted by viewers playing the game when the meeting of the parliament’s Foreign Affairs and Defence Committee was broadcast live. Ms Grande was accused of caring more about the game than issues of national security, but during a break from the meeting, Ms Grande defended her actions saying she has a head that ‘listens better when she is doing brain dead’ activities.